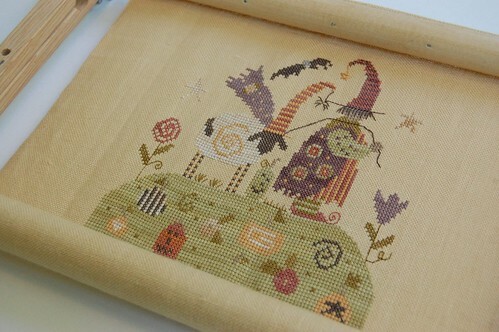 I finished up the top part of "Happy Haunting" this morning! Now it's on to the fun part... The bands of specialty stitches! Nothing really going on here. Just hanging out with Matthew today. Write soon! Oh, Nicole, your stitching is so lovely! I did this piece last year and framed it to use as a "seasonal decoration", but I love it so much that it hangs year round! AND! You are a genius for stitching that top part first! Now you get to have fun fun fun! That is a really sweet chart! Looking lovely. I can't wait to see more. Gorgeous! Of course now I want to get mine back out, LOL. Its turning out nicely so far, look forward to seeing the specialty stitches. I just love that sampler! Any chance I could have it after you finish stitching it? LOL! Enjoy your day with cute Matthew! Oh Nicole, what a nice piece this is. Even the top part alone looks wonderful. I'm looking forard to seeing the bands stitched. Happy Haunting looks gorgeous! Love that chart. It looks great Nicole and so does your Quaker girl (I think I missed that post). You always pick the best projects to stitch!! HH looks so cool, Nicole. You are making fast progress on this one. Oh wow that is just so beautifubl and cute too! I thought about getting it but couldn't afford all the threads. You are doing a beautiful job on it!! You just get so much done! It's so cute! I love how it's looking! That looks so cool already! Can't wait to se more of it. Oh my gosh, this is looking so good! I swear you are a constant source of inspiration... every time I read your blog I want to leap up and go stitch something! Very fun! I love this one! I love this, so very cute! Gorgeous, love the fabric too! That is so pretty..love the colors. That's really cute. IT looks great!! What a very cute design! It's so cute, Nicole! And your work on it is lovely. Didn't you stitch the SB Little Witch or Baby Bug Ball once? It will look great with either/both of those if you did! You really cruised through that top part fast! How sweet is this? I love it!!! Looking forward to seeing it all unfold. Oh I love this sampler. I have this in my stash, and seeing yours makes me want to get mine out, really bad! Thanks for the inspiration. It looks mighty pretty, Nicole!! Enjoy those specialty stitch bands. This will be a wonderful fini soon! It looks awesome! Can not wait to see more of it! !